In the world of millwork installation, the coped joint is favored because it can leave a clean looking joint on even the worst looking walls. However, the mitered joint is often-times used instead, because it is significantly faster to cut. A new product called the Scribe-Master Cope-Pro is making its way to North America from the UK that claims to deliver clean copes that only take seconds to cut. Using a thicker version of a contour gauge, the stainless steel combs on the Scribe-Master can accurately make a negative copy of the profile on your baseboard or chair rail. Once the negative is setup, a router is used to do the cutting, while a copy pin follows the profile of the negative. The negative is flipped to cut both left and right-hand copes, and it can be adjusted to compensate for out-of-plumb walls. 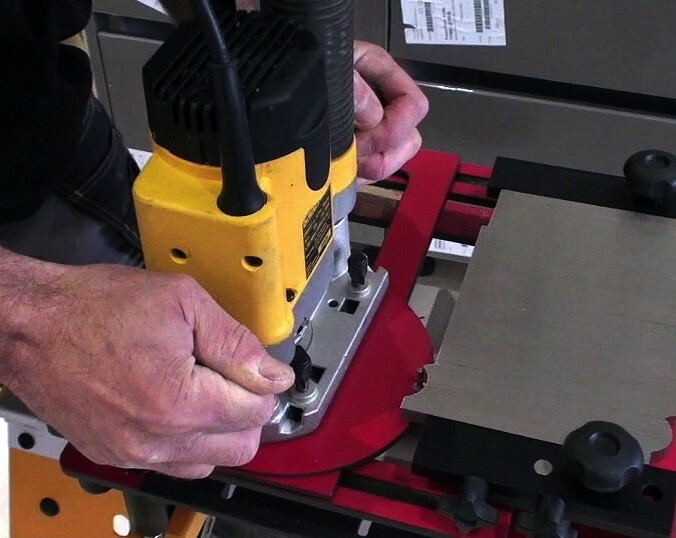 The table on the Scribe-Master is tilted slightly to provide cuts that are back-beveled, which ensures a tight fit even if the wall is out of square by a few degrees in either direction. 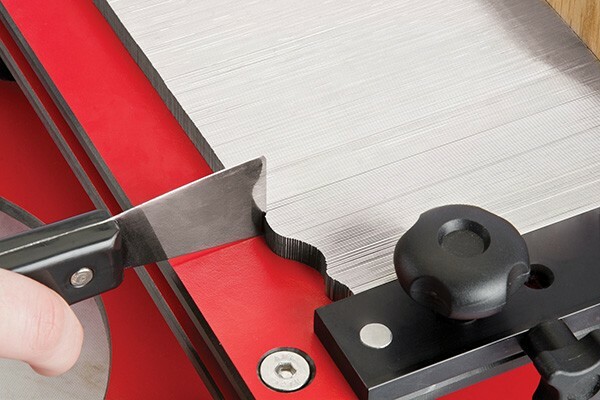 Since the combs can be adjusted, the Scribe-Master Cope-Pro can be used to scribe millwork to other materials, like brick, stone, or tiled walls. It can even be used to create, dados, half-laps or tenon for other applications. 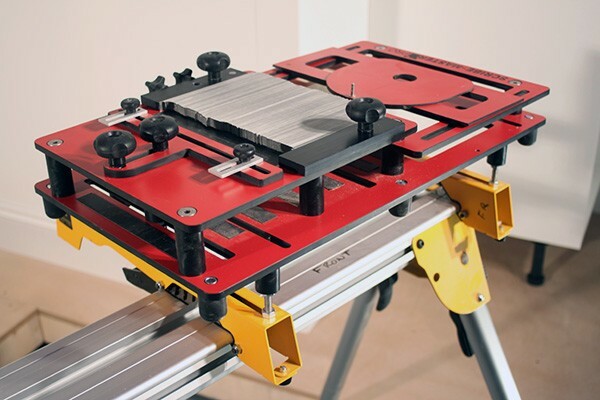 Made in the UK of high-pressure laminate and stainless steel, the Scribe-Master Cope-Pro comes pre-assembled and ready to use as a standalone unit or can be quickly mounted onto your miter saw stand with the optional mount kit, sold separately. 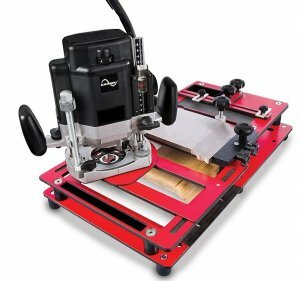 The Scribe-Master Cope-Pro, model SMP11, retails for $399 and comes with a 1/4" HSSE twin flute spiral cutter, screws, work-piece clamp and comb alignment tool along with full instructions. I have some concern has to how much detail can be copied when working with a 1/4" bit and millwork that has sharp or really small details. Still, I would rather get close with the Cope-Pro and then fine tune with sandpaper then to have to do the whole thing with a jigsaw or a coping saw. Typically I would cope with a jigsaw and get close enough and then sand to the edge, so the Cope-Pro would still end up being faster. My other concern is with cut-time on hardwoods and how long the router bit would last. In the video, they can cut a soft wood (I assume) in only 15 seconds or so, but I usually have to work with oak, mahogany, maple and other hardwoods. The cut-time would still probably be faster than cutting with a jigsaw, but how long would the small router bit last? If I was setting up the Cope-Pro, I think I would figure out a way to have it mounted in line with my miter saw. Right after I am done making my cuts, I could just slide it into the Scribe-Master and got to town. 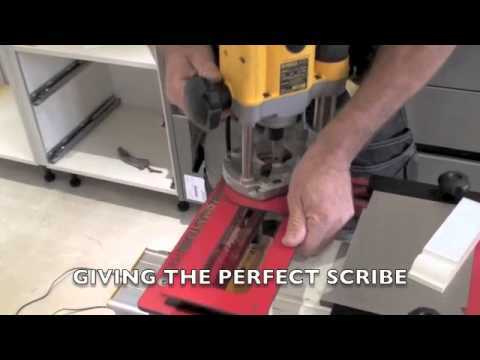 The Revolutionary new Scribe-Master Pro Jig showing how easy it is to scribe 7" Softwood Skirting in under 15 seconds..